An inspiring and strong woman in a rapidly changing world, she was crucial both for the advancement of women in the English theatre and for the formation of the National Theatre. She made her name in H.A. 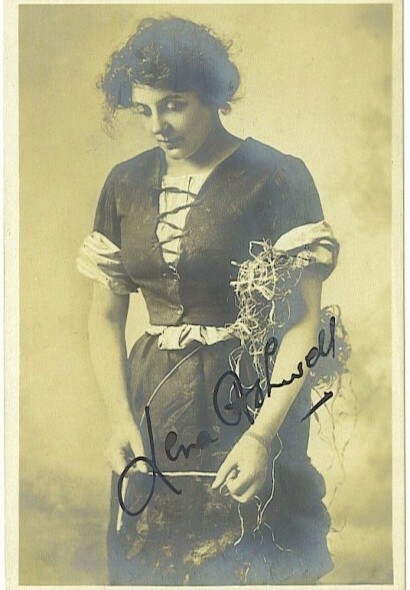 Jones’ Mrs Dane’s Defence in 1900 and presented ‘new drama’, including Cecily Hamilton’s Diana of Dobsons (1908) and J.B. Fagan’s The Earth (1909) at the Kingsway and Savoy Theatres, as well as being active in the Actresses’ Franchise League and a committed founding member of the British Drama League. When war was declared on 4 August 1914, with amazing rapidity, Ashwell, Decima and Eva Moore and Eve Haverfield formed what Ashwell later described as a ‘really wonderful and most comic organization’, the Women’s Emergency Corps. A temporary office was set up in Robert Street, Adelphi; letters were sent to the press and a public meeting convened at the Shaftesbury Theatre on 7 August. The Corps’ first task was to create a register, for use by any authority requiring such services, of all women, with their particular skills, who could help the war effort. The list included cooks, interpreters, crêche and mother carers, stores’ distributors, clothing collectors and distributors, carers of horses and riders, motor drivers and ‘all women trained in any capacity’. Immediately, many hundreds of women offered their services and women’s suffrage took a back seat while Britons adjusted to a changed world. On 4 September the WEC had 10,000 women registered and government departments, railway companies, and business houses had been informed of competent unemployed women available for work previously done by men. Ashwell also established the Three Arts Club Emergency Relief Fund, recognising female arts workers would be particularly hard hit by the war’s impact on employment. August was traditionally a time when many London theatres were closed for summer and suggestions were made to halve admission prices and actors’ salaries; already many were on the breadline. In co-operation with organisations including the Actors’ Benevolent Fund, Ashwell hoped to help those in urgent need to obtain paid employment; to give training for such employment and maintenance when required; and to obtain and administer grants from existing funds for the relief of such cases. 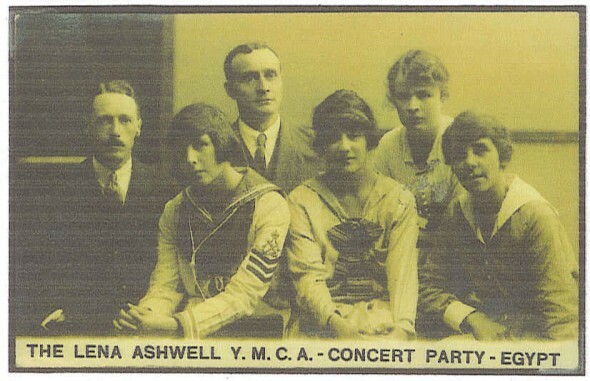 For the duration of the war, Ashwell auditioned artists and prepared thousands of concerts and performances in YMCA camps and hospitals and on ships at the Front and in firing line zones. Between 1915 and 1919 over 600 artists, in parties of up to six singers, instrumentalists and entertainers gave three concerts a day all over France, in Belgium, Malta, Egypt and Palestine. Over £100,000 was raised through donations, concerts in England and colourful events to pay for this project and there were few soldiers who missed experiencing the comfort from home represented by these programmes. When peace was declared, her Lena Ashwell Players set about taking regular theatre performances into local communities throughout London and beyond. Long before educational drama and public subsidy for the arts were realities, she engaged local authorities in the provision of facilities and support for her work. 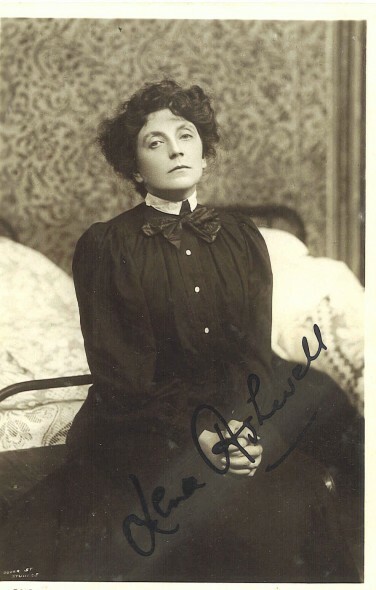 The above is just a brief sample of Lena Ashwell’s extraordinary life and commitment to a better world, through participation in the arts, as an actress, manager and advocate. Although she wrote four books about her work (including Modern Troubadours about her wartime experience and an autobiography, Myself a Player), her achievements have been largely unsung. 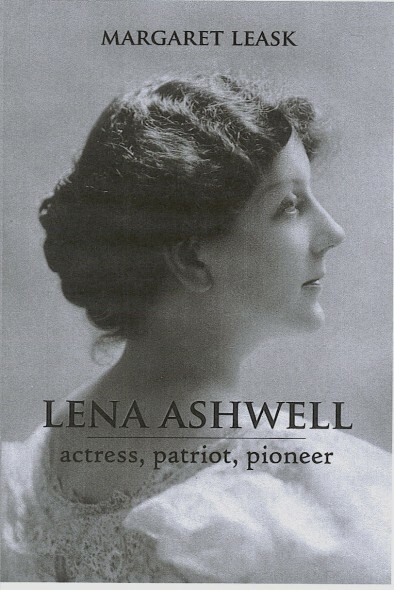 However, with the publication of Margaret Leask’s biography, Lena Ashwell: Actress, Patriot, Pioneer, by the University of Hertfordshire Press and the Society for Theatre Research in 2012, there is now the opportunity to appreciate Lena Ashwell in the historical and cultural contexts in which she worked and which she helped to transform. I always love your site. This post is fascinating, and gives me another book to look for!